Raul’s twin guitar attack. As heard in Magic Dirt & River Of Snakes. 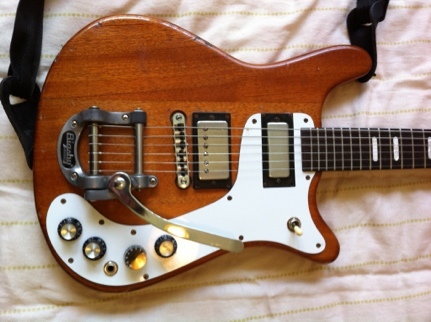 Basically, Tym asked if he could build me a guitar back in 2000, I asked him to build me a copy of an Epiphone crestwood deluxe, but with two pick-ups, the bridge being a Jeff Beck special, a bigsby whammy bar and 24 frets. He also made it a lot stronger than the original epiphones( he knows I can get pretty rough) and twice as thick. 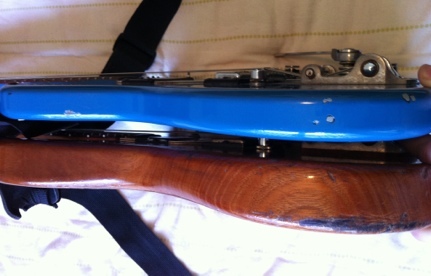 I got it in 2001 I think, it is a great instrument, loads of sustain and a thick, deep tone, that rings like a bell. 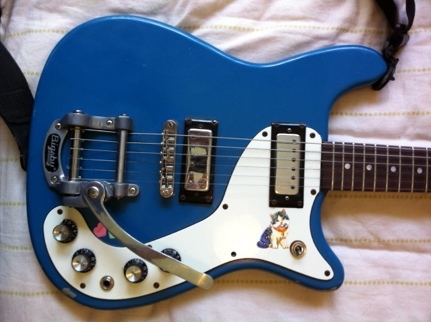 I loved it so much I kept asking him to make me another, so around 2005-6 he did, I wanted a white one but he made it blue…now I am glad he did, I reckon it looks killer. The blue one is now my favourite, its a lot closer to the originals. 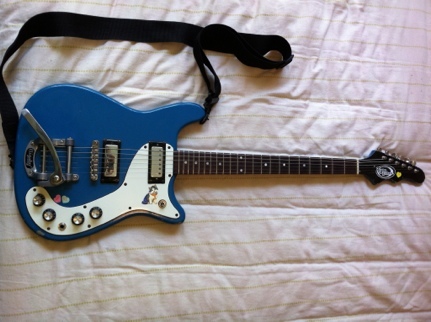 Slim, with two mini-humbuckers and a bigsby whammy, it has a sweet midrange and cuts like a knife, the neck is slender and well I love it to bits. They were my main guitars in Magic Dirt and now in River of Snakes, I don’t play them in Midnight Woolf as prefer single coils for that garage/surf sound. Here’s Raul playing his blue Tym Crestwood in his awesome new band, River Of Snakes at the Hot Snakes show.